Global Industrial Packaging Market was valued at $53,743 million in 2016, and is expected to garner $69,787 million by 2023, registering a CAGR of 3.9% from 2017 to 2023. Industrial goods are heavy, bulky, sensitive to external atmosphere, and hazardous to environment. Thus, it is necessary to conserve the product for longer time during storage and transportation specifically with hermetically sealed packaging and secured from external contamination. Industrial packaging is different from other types of packaging in thickness, strength, and the level of protection it provides for extended storage. Rise in building & construction activities in majority of the emerging economies especially in India and China, rise in food & beverages industry to meet the demand of growing population, and the rapid growth of exports, which requires superior packaging standards for the international market, are the major factors that are expected to the market growth during the forecast period. 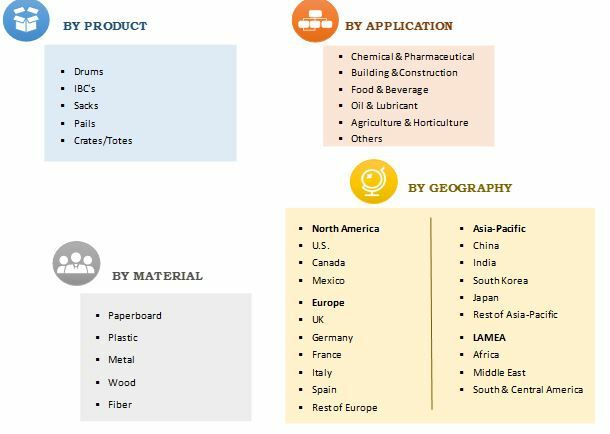 The global industrial packaging market is segmented based on product, material, application, and geography. Based on product, it is divided into drums, intermediate bulk containers (IBCs), sacks, pails, and crates/totes. On the basis of material, it is classified into paperboard, plastic, metal, wood, and fiber. Based on application, it is categorized into chemical & pharmaceutical, building & construction, food & beverage, oil & lubricant, agriculture & horticulture, and others. Geographically, it is analyzed across North America, Europe, Asia-Pacific, and LAMEA. In 2016, Asia-Pacific was the highest revenue contributor to the global market, owing to the increased manufacturing activities in the emerging economies, such as India and China, to meet the high demand by the rising population. China dominated the industrial packaging market, in terms of revenue, and accounted for more than half of the market share in Asia-Pacific in 2016. The food & beverage segment is estimated to grow at the highest CAGR of 4.4% from 2017 to 2023. Industrial packaging plays a critical role in meeting food safety requirements. It maintains seamless and clean transition with minimal human contact from process and picking to packaging. 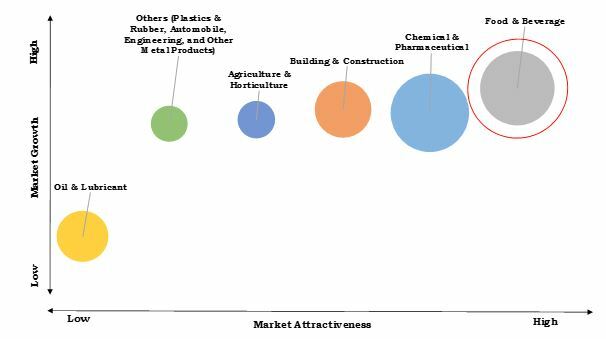 The chemicals & pharmaceuticals segment is the second most attractive applications in the market. Large number of steel drum and rigid IBCs are required to store and ship the chemicals. The use of industrial bulk packaging in pharmaceuticals has increased due to increase in geriatric population and growth in chronic diseases. In 2016, the chemical & pharmaceutical segment accounted for the highest market share growing at a CAGR of 4.0%. In 2016, the sacks segment accounted for the highest market share, growing at a CAGR of 2.7% during the forecast period. Advancement in the construction of multiwall sacks with high burst strength and tear resistance prevents product leakage. Moreover, sacks packaging optimizes cargo space without compromising protection, which has a key impact on the logistics and distribution costs. Growth in economies and rise in middle-class section in South & Central American countries, such as Brazil, Argentina, Costa Rica, and others, have led to growth of the food & beverages industry. Brazil’s large manufacturing base and well-developed agro-export industry are expected to drive the industrial packaging market. The Brazilian agro-products industry, with a global share of 25% in the food market, is the key factor that accelerates the market growth. Moreover, the building & construction activities in Brazil have increased rapidly with the growth in economy of the country. The rise in megaprojects can be seen throughout the region. Henrique de Campos Meirelles, minister of finance and an executive of the Brazilian and the international financial sectors stated that the megaprojects are expected to have an annual investment of $23 billion, boosting the market in the building & construction sector. The key players profiled in the report include Grief, Inc., Mondi PLC., Amcor Limited, Westrock Company, International Paper Company, Bemis Company, Inc., Orora Limited, Mauser Group, Sigma Plastics Group, and Wuxi Sifang Drums Limited Company. The other key market players (not profiled in this report) in the value chain include Sealed Air Corporation, Tekni-Films, Inc., United Drug Plc., Vetter Pharma International, Aphena Pharma Solutions, Beacon Converters, Inc., Bilcare Research, Catalent Pharma Solutions, and Constantia Flexibles. The report provides an in-depth analysis of the current trends, drivers, and dynamics of the global industrial packaging market to elucidate the prevailing opportunities and tap the investment pockets. It offers qualitative trends and quantitative analysis of the global market from 2016 to 2023 to assist the stakeholders to understand the market scenario. In-depth analysis of the key segments demonstrates the product utilized in industrial packaging and their applications. Competitive intelligence of the industry highlights the business practices followed by key players across geographies and the prevailing market opportunities. Key market players along with the strategies and developments are profiled to understand the competitive outlook of the market. Industrial packaging comprises drums, intermediate bulk containers (IBCs), sacks, pails, crates, and totes, which are made of materials such as paperboard, plastic, metal, wood, and fiber. It is used to pack numerous products intended to be used for industrial or commercial purposes, which facilitates distribution. It is designed to protect the consumer and industrial goods from shock & vibration and atmospheric, magnetic, and electrostatic forces during storage or transit. The chemical & pharmaceutical is the largest application segment in the global industrial packaging market. Chemicals are sensitive to temperature, external weather condition and can be hazardous to environment, thus needs to be packaged durably. Surge in the consumption of chemicals by plastics, pharmaceuticals, paints & coatings, cosmetics, and other end-use industries has led to the growth in production of chemical, which drives the industrial packaging market. According to the National Institutes of Health report, the population of people above 65 years was estimated around 524 million in 2010, which is expected to grow to 1.5 billion by 2050 leading to increase in occurrences of chronic diseases. Increase in R&D for the development of new drugs drive the growth of pharmaceutical industry. Industrial packaging helps to preserve biologics, vaccines, drugs, and other temperature-sensitive pharmaceuticals products. The evolution of manufacturing industries in the emerging economies, such as China and India, is the key driver for the market growth. In addition, rapid growth in the food & beverages industry to meet the demand for increasing population and the growth of exports and imports globally, which requires superior packaging standards for the international market, propel the market growth. Moreover, extensive R&D in industrial packaging is expected to create a positive impact on the market growth.